Our beloved 5 string banjo has undergone a number of important modifications over its short history as a popular musical instrument. The addition of the fifth string in the mid-nineteenth century, the Loar-inspired Mastertone design and the Stelling wedge-fit pot assembly have all been important mileposts in modern banjo design. Now, with the introduction of the STEALTH, Scott Vestal puts his mark on banjo design in much the same manner as he has as a player - boldly, creatively and with what is sure to be a lasting effect. From the innovative Hidden 5th String to the meticulously radiused fingerboard and sleek contemporary lines, the STEALTH represents a new standard in banjo building. Click on the headstock buttons to get more information and see more photos of this exciting new banjo. 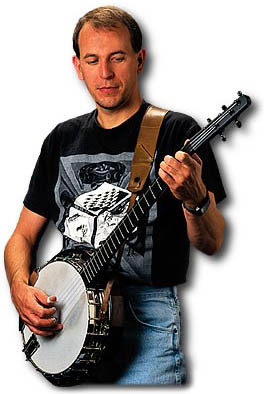 Scott's distinctive tone is something that banjoists have been seeking for years, many putting their own instruments through multiple mutations in search of "that sound." Owning a STEALTH is as close as you can come to producing the tone that has made Scott Vestal one of the most admired players in recent history. Of course, with the technical difficulty of so much of Scott's material, ease of playabilty is a must and the radiused fingerboard and attention to detail make this banjo exceptionally smooth and easy to play. "The Stealth is the result of my many years of experimenting with banjo design. Each one is hand made using the finest materials available and setup to exact specifications by myself."